Acting Balanced: Five Question Friday #5QF and Four Fill In Fun! 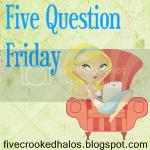 Five Question Friday #5QF and Four Fill In Fun! Not really, we did take Robyn out for a graduation lunch celebration though. 2. What's your favorite summer tradition with your children? Pack a picnic lunch and go bike riding - either along the boardwalk at the beach or take the ferry across to the Toronto Islands! And now for some Four Fill In Fun! 1. When I get five minutes to myself I like to take a really hot bath and soak my troubles away! 2. I wish I was able to get home to Canada for more family events. 3. If the world is my oyster then I'm lucky to find a rare pearl! 4. My favorite meal of the day is breakfast and the food I think would be my favorite to eat then would be omelets!